I was in my local Target the other day and took a quick cruise through the clothing section – and was literally stopped dead in my tracks. The new line from Target – Universal Thread had plus size items IN STORE. I went into a mini-buying frenzy. Here are my favorite Universal Thread Plus Size Finds from my recent shopping spree. *This post contains affiliate links! I put this jean jacket on and was actually MAD because it fit so great and looked amazing. Why was I mad? Because I have a dozen denim jackets and didn’t need another one — but I HAD to buy it! The same thing happened with this plus size denim shirt dress! It fits like a dream and is made from a light, but substantial denim. So the dress moves with your body and looks great. I couldn’t say no to this denim shirt – it’s so soft and I love the light blue wash! Full disclosure – the next two items I didn’t buy, but spotted online and already have my order in! And this worn-in sweatshirt just looked so cozy and comfortable, that I had to have it. Have you shopped the new Universal Thread Plus Size collection at Target yet? Tell me what you think! Get style tips, outfit inspiration and product reviews from Style Plus Curves! IMAGES MAY NOT BE DOWNLOADED, MANIPULATED, OR REPRODUCED WITHOUT PRIOR WRITTEN PERMISSION FROM AMBER MCCULLOCH. COMMERCIAL OR PRIVATE USE WITHOUT EXPLICIT WRITTEN CONSENT IS PROHIBITED AND PUNISHABLE THROUGH US AND WORLDWIDE COPYRIGHT LAWS; THIS APPLIES TO ALL CREATIVE ELEMENTS, INCLUDING PHOTOGRAPHY, GRAPHICS, AND WRITTEN CONTENT. 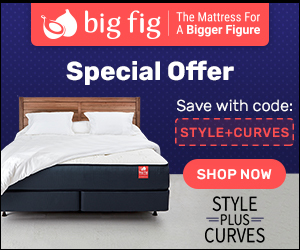 DISCLOSURE: SOME POSTS ON STYLE PLUS CURVES ARE SPONSORED, PROVIDING COMPENSATION OR FREE PRODUCTS IN EXCHANGE FOR HONEST AND UNBIASED REVIEWS. IN ADDITION, SOME LINKS ON THIS PAGE MAY GENERATE SMALL COMMISSIONS THROUGH AFFILIATE NETWORKS.